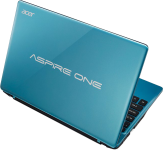 Aspire One netbook by Acer redefines mobile connectivity with its compact size and fun and powerful computing features. It is designed to deliver continuous access to the Internet and a simplified wireless experience no matter where you are.It was designed to get you online in no time at all; start-up and shut down times are reduced to the minimum making it a user-friendly machine. To further improve your netbook, get a memory upgrade today.